Posted on Wed, Mar 21, 2012 : 9:58 a.m.
Make no mistake, Greg Mattison loves having three new defensive pieces to work with this spring. But through the first week, he's doing his best to curb his enthusiasm with regard to early-enrollee freshmen Jarrod Wilson, Joe Bolden and Kaleb Ringer. Because, frankly, they haven't done anything yet. "This isn't cross country," the Michigan football team's defensive coordinator said Monday. "They could come out there and run like crazy, I love those kids and I'm so happy they're here. "And they could be the best runners in the world. If they don't hit anybody, I won't like them as much." Per NCAA rule, teams must go through a spring acclimatization period that forces them to practice without full pads for the first two organized workouts. Michigan defensive coordinator Greg Mattison, above, has three early-enrollee freshmen to work with in spring camp. He likes their attitude, but will reserve judgement until he sees them in pads. The Wolverines opened spring ball on Saturday and held their second workout Monday, meaning Tuesday's closed workout was the team's first chance to don pads and actually hit. Bolden, a 6-foot-3, 220-pound linebacker; and Wilson, a 6-foot-2, 190-pound defensive back; enter spring camp as highly-touted prospects. Both received four-star ratings from Rivals and Scout. Bolden registered 86 tackles and three sacks as an outside linebacker last season at Colerain (Ohio) High School, and served as a captain in the Under Armour All-America Game. Wilson, who was coached in high school by former Michigan running back Ricky Powers, racked up 71 tackles and three interceptions at Akron Buchtel -- eventually ending his season as a first-team all-state performer. Ringer, meanwhile, is a 6-foot-1, 225-pound linebacker who received a three-star ranking. All three will have their chance to get ahead of their fellow freshmen classmates this spring, if they can hit, that is. Mattison was asked specifically Monday what he'd seen from Wilson in the early going, but he couldn't offer much insight outside of the fact that -- like most rookies -- he had a few stars in his eyes. "I've seen that he's a guy that has books in his hand and came from a class that he's never seen before and saw some pretty girls, probably," Mattison said. "But I can tell you this, I'm glad he's here. "I'm glad all those freshmen are here, I wish we could have our entire signee class come early. But I can't evaluate any of them yet because they've had no pads. But I do like their attitudes." Thu, Mar 22, 2012 : 4:37 a.m. Even with our depth at LB i wouldn't be surprised if Bolden ended up getting some playing time. He already has the size and speed, and the early enrollment will help with the mental aspects. It wouldnt surprise me to see Bolden come in for Morgan at some point sooner or later. Not that I think Morgan is bad, but Bolden looks pretty promising. Time will tell I suppose. Thu, Mar 22, 2012 : 1:34 a.m.
hopefully with all the commits will decide to enroll also. But I do have more bad recruiting news as the recent commit Ohio d-back Coenely, has only received a 5.6. A low 3 star rating. Hoke started off hot , but a Iv'e said before he fails to get any decent skill recruits. Maybe he should back off and be patient ? Thu, Mar 22, 2012 : 2 p.m.
i have bad recruiting news. . . coenely. . . ohio cheerleader recruit/scout/has only received a 1.0. a low 0 star rating. i have good recruiting news. . . gareon conley. . . MICHIGAN football recruit/scout/has received a 4* rating. GO BLUE!!!!!! Thu, Mar 22, 2012 : 4:52 a.m. Wed, Mar 21, 2012 : 10:55 p.m.
Would be tough to start at LB or safety. We look pretty deep there. Only DL, OL and a kick returner look likely to play freshmen. To bad Kalis Pipkins, and Norfleet couldn't make it early. 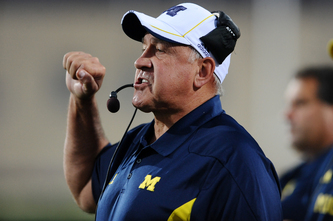 Wed, Mar 21, 2012 : 9:33 p.m.
Greg Mattison will be an excellent mentor to the early enrollees. Let the fun begin...Go Blue!! It would be great to see more athletic guys at the second and third level! Guys who are just as good in pass coverage as knocking a RB out! How many times did we see last year a LB have a pass go right by his earhole and he did not even know it (not as many as the previous 3 years, but it was still bad)! I think that Mattison is starting to get away from the &quot;bend dont break&quot; type of scheme to a &quot;shut down on every play style&quot; because of personel changes and improvements. I personally dont think there will be a huge offset from last year to this in the front 4 and the 2nd and 3rd levels I think will be two of the best groups in the nation. Go Blue!!! Wed, Mar 21, 2012 : 5:59 p.m. The opportunity for true freshman to come in and contribute is rapidly closing. Bolden would probably have stared on the last three Michigan D's, but he may need to wait until 2013 before he becomes a major contributor. Wed, Mar 21, 2012 : 5:52 p.m.
Don't put too much hope on these freshmen. New guys have to earn their helmet wings first, no matter they are 4 stars or 5. High school balls are so different from college balls. Wed, Mar 21, 2012 : 6:27 p.m.
&quot;earn their helmet wings first&quot; - please dont remind us of that the poor leadership that was manifested in players being without their wings. When a player signs a letter of intent, gets on campus, and makes it to the first practice, he gets his wings, and he keeps them until he is off the team for whatever reason. That is part of the deal with signing to play for UM. They then have to then earn playing time - but not their wings. They already earned them, they were already given them. They signify that a player is part of the family, and that players and coaches will look out for them. The uniforms signify all of that, with the wings being the most prominent symbol of the uniform and the team. Without them a player is just maize/yellow/gold and blue. Taking away what sets them apart was just dumb leadership, and really showed that RR had already failed. Wed, Mar 21, 2012 : 4:02 p.m.
1) Acclimatization is used improperly, but more aggregious is that 2) Wilson is from Kentucky and did not play for Ricky Powers -- I bleive that was Gant. Wed, Mar 21, 2012 : 10:51 p.m.
Why do people pick through an article looking for a spelling error or a factual error? Maybe that's what causes unhappiness. My wife is 95% great but I'll focus on the 5%. Everything in my body works except I have a bad knee so I'll focus on that. And if i can't find something wrong I'll still see it as wrong. Wed, Mar 21, 2012 : 5:58 p.m.
Plus, the usage of acclimatization is fine, as used. These players are getting used to a new physical and mental environment. Hence, they are being acclimated to college and college football! Thickness abound. Wed, Mar 21, 2012 : 5:56 p.m.
Plus, it's egregious. If you are going to criticize a writer, try to write well and be better informed. Check your facts, not trust your mouth to brain reactions. Wed, Mar 21, 2012 : 4:57 p.m. Wed, Mar 21, 2012 : 3:16 p.m. Wed, Mar 21, 2012 : 5:44 p.m. Wed, Mar 21, 2012 : 3:06 p.m. Wed, Mar 21, 2012 : 2:19 p.m. Wed, Mar 21, 2012 : 2:10 p.m.